Many of you feel in love with Rie Elise Larsen’s pleated lampshades I posted yesterday. I found diy instructions on marthastewart.com so that we can all make our own. Super easy. Basically you fold decorative paper accordian style, holes are punches around the shade, and a string is threaded through the holes to pull the shade together. See the full instructions here. Need a source for decorative paper to make the shades? 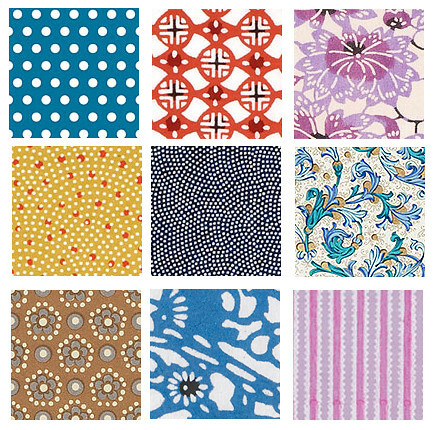 Try Paper Source for a large selection of Japanese, Indian, and European papers. A few of my favorites below. Also try using wrapping paper, wallpaper, or paper you have hand stamped. Have fun! I made some pleated shades from wallpaper back in the early 90’s for my bedroom lamps. I have a fabulous book, “Decorating with Paper” by Donna Lang & Lucretia Robertson that has some amazing ideas for creative looks using wallpapers,art prints, gift wrap, etc. I love this idea, thanks for posting it. Sweet – Nice find! I'll have to save that so I can try it one day!